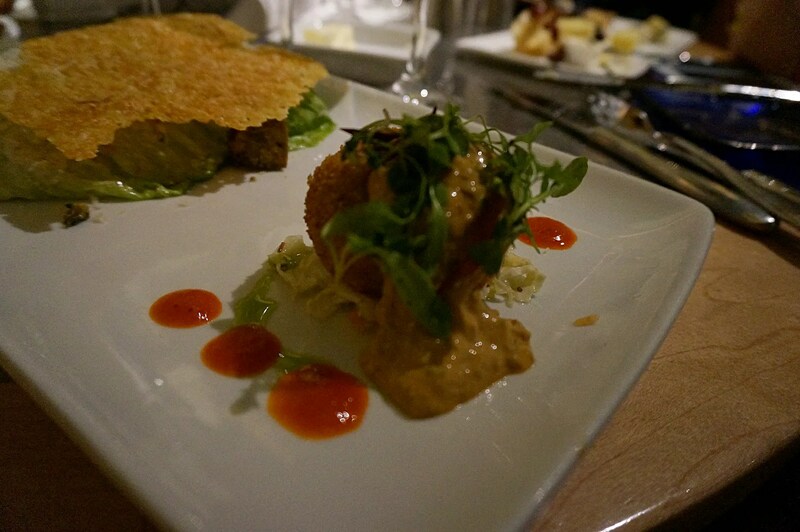 This review is from a dinner which still has me shaking my head in disbelief. I will attempt to convey to you the series of events which occurred during this meal and led to a somewhat shocking conclusion. 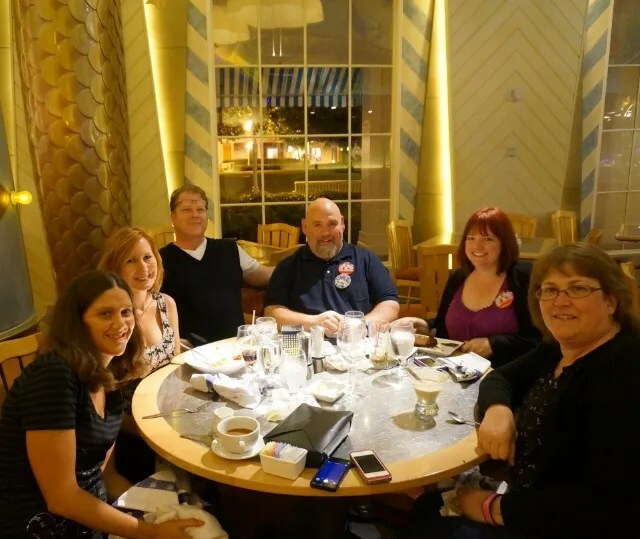 However, this dinner took place more than two months ago now and my memories of it are starting to fade. Well actually, to be honest, I walked out of Flying Fish that night wondering “what the heck just happened here?? ?” But I’m getting ahead of myself, so let’s go back and start at the beginning. Beth (Couchy) was also to join us for dinner but she had not yet arrived at the restaurant when we were seated a few minutes later. I like the circus-themed decor here. Others have called it whimsical, and I would agree with this description. 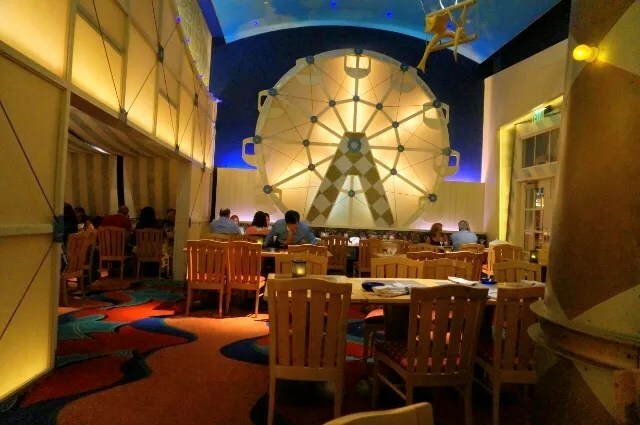 I especially love the decorative ferris wheel which covers most of the back wall of the restaurant’s main dining room. 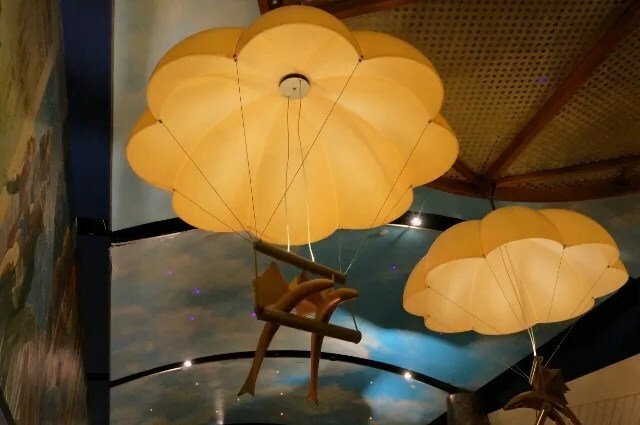 And I also really like the many parachuting “flying fish” which are suspended from the sky-like ceiling. In the process of being seated, Brenda had a mishap with a neighbor’s umbrella which was left on the floor in the area behind her chair. She injured the same foot (or was it ankle???) that she had injured and had in a cast within the last year. Despite the swelling and pain that she was probably experiencing, she was a trooper and didn’t let it put a damper on her evening. 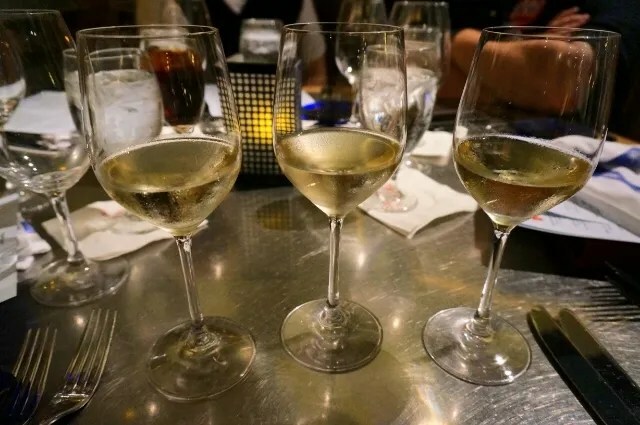 This also seemed to be an international trio of wines, as one was German (Selbach-Oster Kabinett), another was from New Zealand (Mohua), and the third was a U.S. riesling from California (Fess Parker). I had had the other two wines previously, but this was my first taste of the Fess Parker riesling and it turned out to be my favorite of the three. I call it this for two reasons. First, because it tasted like nothing…no flavor at all. And the unsalted butter was of no help to the flavorless bread. The second reason is that this very, very minor part of our meal started a “spark” which may or may not have caused this meal to go up in flames. 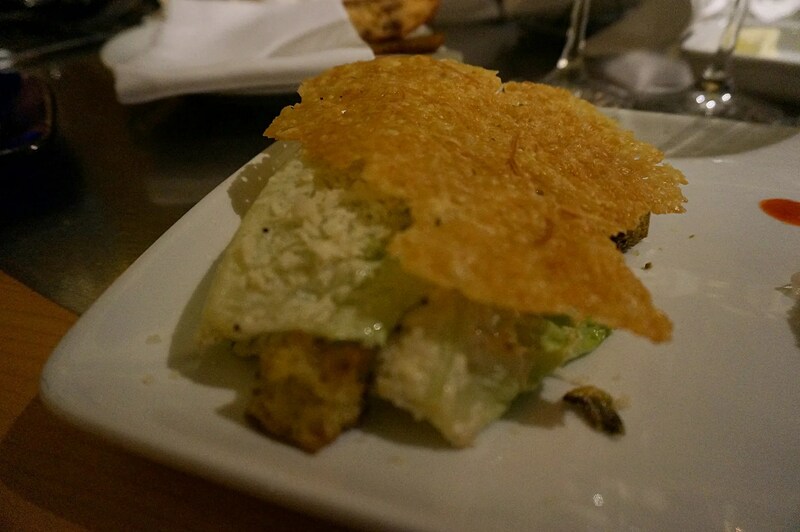 What makes this Caesar salad especially good is the Parmigiana-Montegrappa Frico which is served on top. For parmesan cheese lovers like me, this wafer-thin parmesan cheese-flavored crisp is delicious! 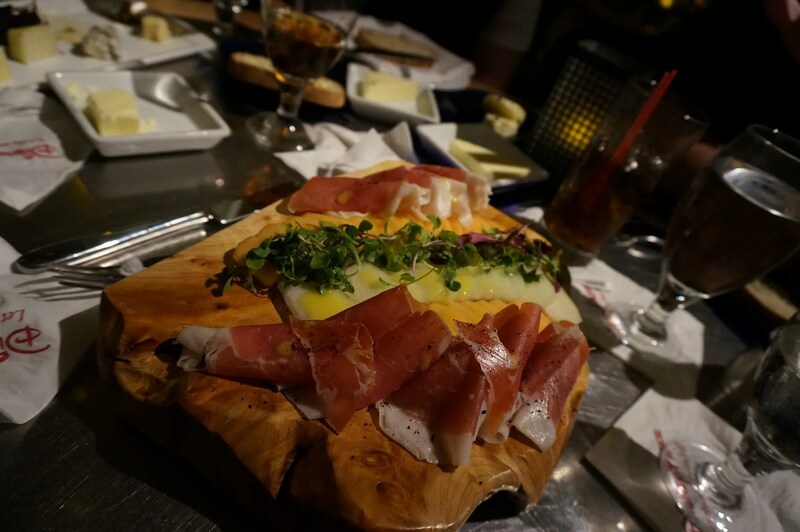 And speaking of cheese, Paula and Hunter also ordered two cheese plates for everyone to share. 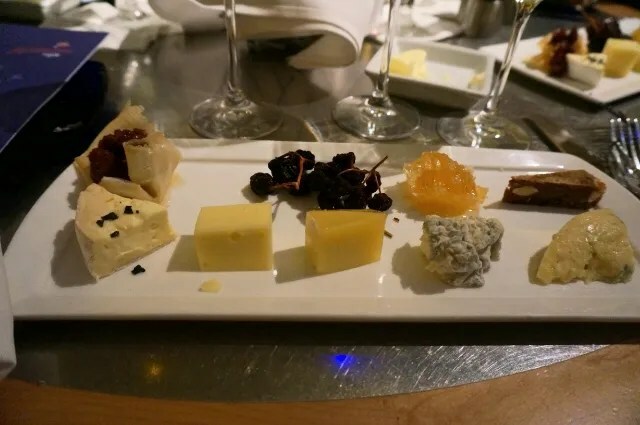 I was impressed that there were five different cheeses, as many of the other cheese plates served at Disney restaurants have been reduced to only three or four. 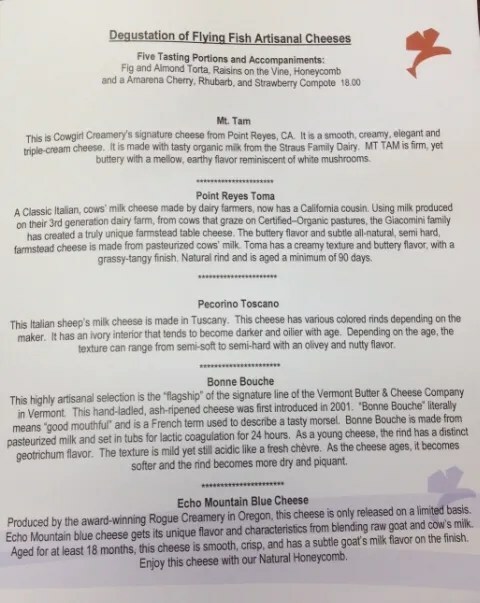 These were all very good, but my favorites were the Pecorino Toscano and the Blue Cheese. I loved to eat these along with a bit of the honey…cheese and honey are such a heavenly combination. Now back to the “Much Ado About Nothing” bread. 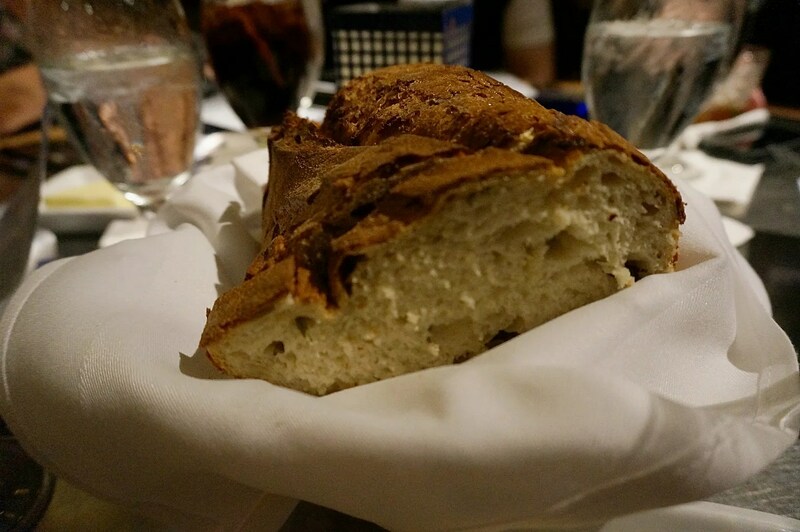 The tasteless bread soon became the topic of conversation at our table, as some of us had just dined at Flying Fish in December and the bread tasted much better then. So when our server brought our appetizers someone (I think maybe Paula??) asked if they had changed their bread recipe recently (or something like that). 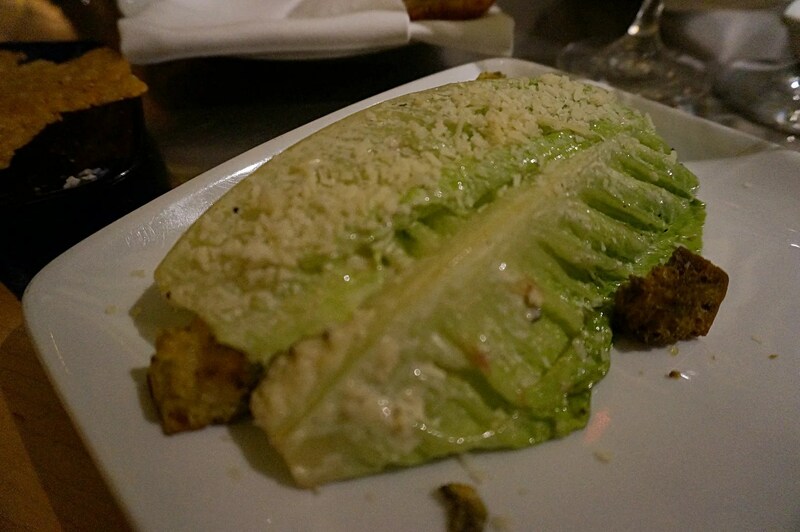 Our server seemed annoyed by the question and by our general opinion that the bread was tasteless. In a defensive tone, he stated that the bread was the same as it had always been. From this point on, his attitude toward us became progressively more impatient and snippy. The nice chef who had previously been at our table to meet with Hunter, was quite the opposite though. When he found out about our bread situation, he quickly provided us with more bread (which again was tasteless). 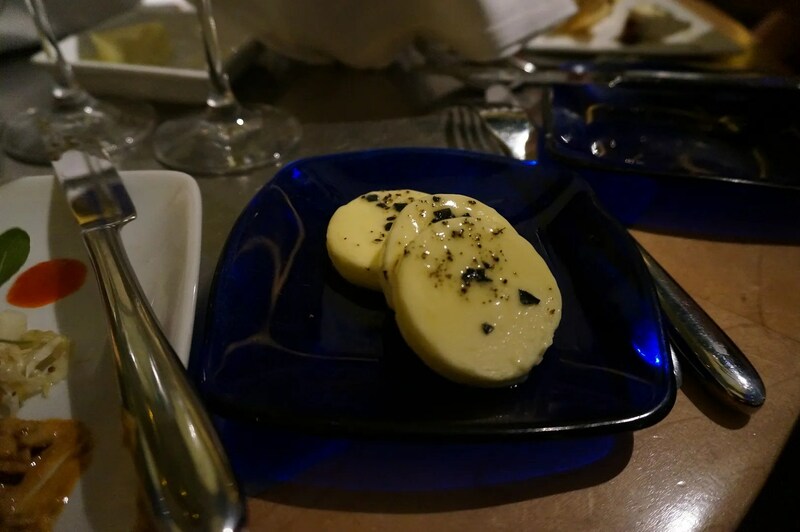 However this time, he sent over some kind of premium-quality butter which was topped with something (maybe sea salt and some kind of herbs???). 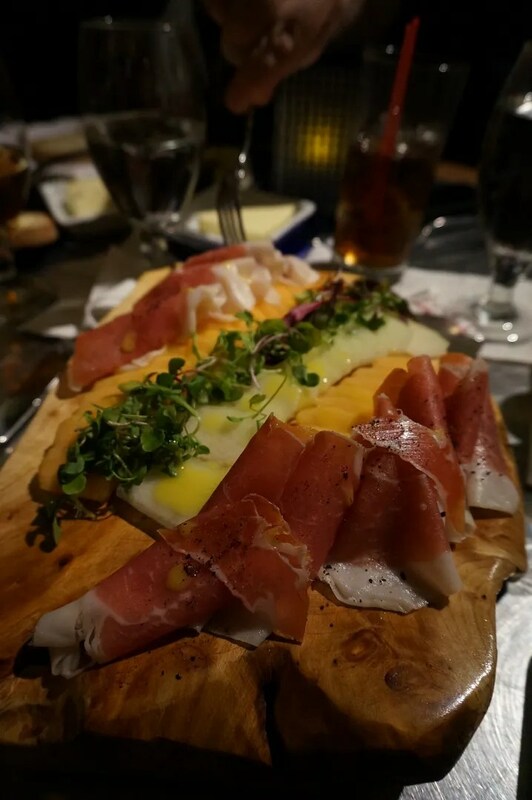 I absolutely love the combination of salty/peppery prosciutto and sweet melon!! I so wish that they would add this to their Appetizer menu. 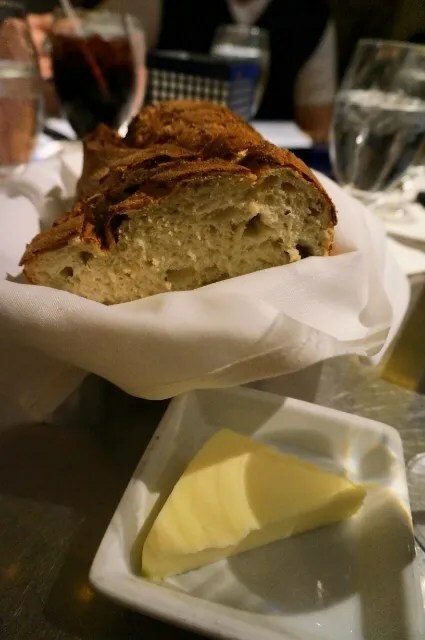 And so the tasteless bread incident would have been long forgotten thanks to the chef, except that our server seemed peeved about the special treatment we were receiving. As an example of this, when our server brought the second batch of bread he set it down in front of Hunter and in a very sarcastic tone said, “I’ll put you in charge of the tasteless bread.” (or something similar) So despite the chef’s wonderful gesture that should have easily doused the tiny spark created by the bread situation, our server kept the fire alive by fanning it with his “bad” attitude. 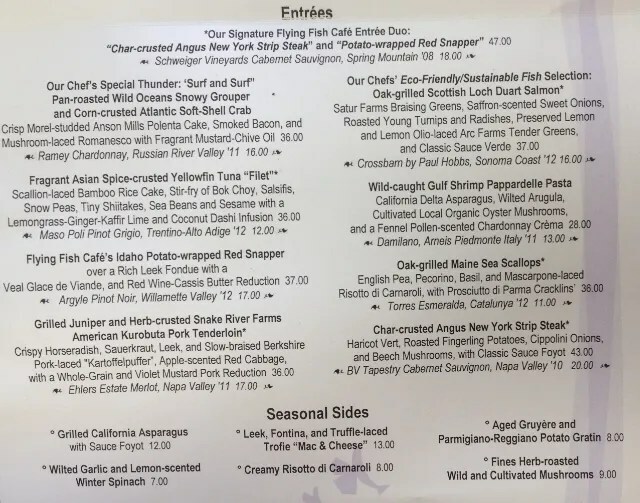 This is my second favorite seafood entree at WDW, second only to the salmon at Artist Point. 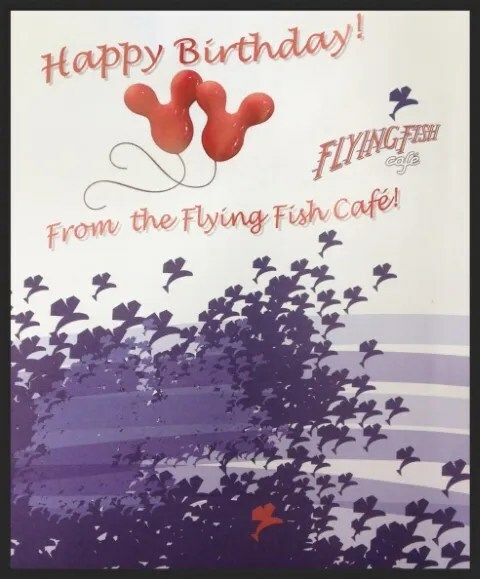 During my second visit to Flying Fish back in May 2011 I ordered this and ever since then I haven’t been able to order anything else there. The smaller portion that you receive with the duo is actually the perfect size for me though, so I was very happy that it worked out for me to share with Brenda. Since Beth was seated next to me at the table, I got to see up-close what she chose for her entree. She not only allowed me to take a photo of it but also insisted that both Brenda and I have a taste. 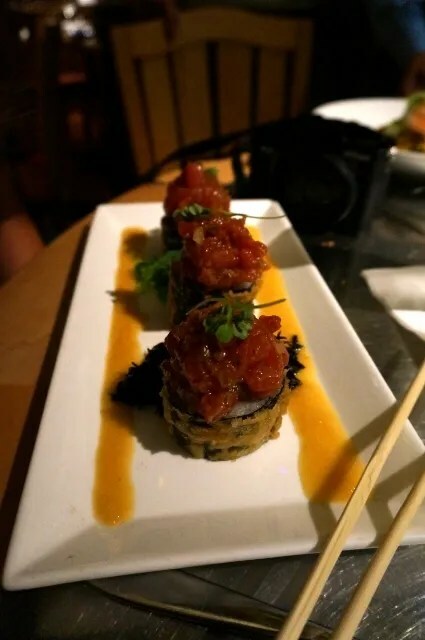 I’m not 100% certain but I believe this was the Yellowfin Tuna Tartare and Crispy Tempura Tuna-Vegetable Sushi Roll that is listed in the Appetizer section of the menu. 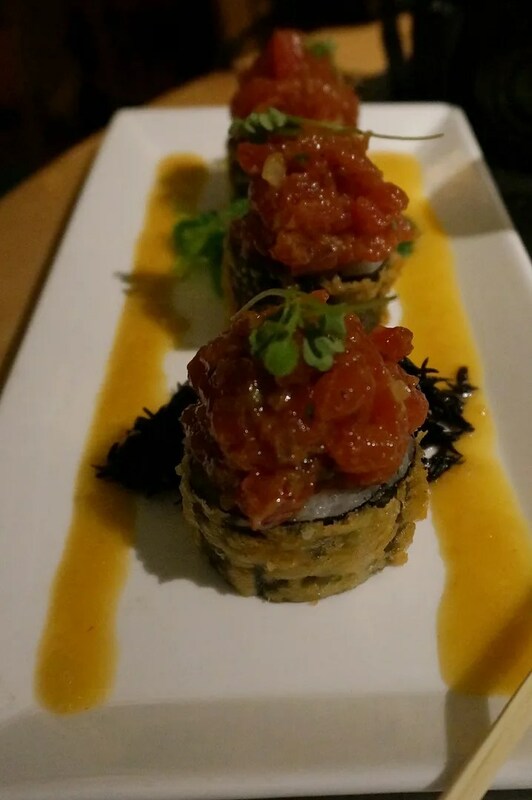 As for my opinion of this dish, well first off I must tell you that previously the thought of eating raw tuna (or any other fish) made me queasy. But this looked beautiful, its appearance was actually much more appetizing than my cooked fish. So with Beth’s assurance that it was delicious, I ventured into the previously uncharted waters of raw fishies and took a small bite of one of her sushi rolls…and it wasn’t disgusting! So I now know that I can take a bite or two of raw fish without losing the rest of my dinner. 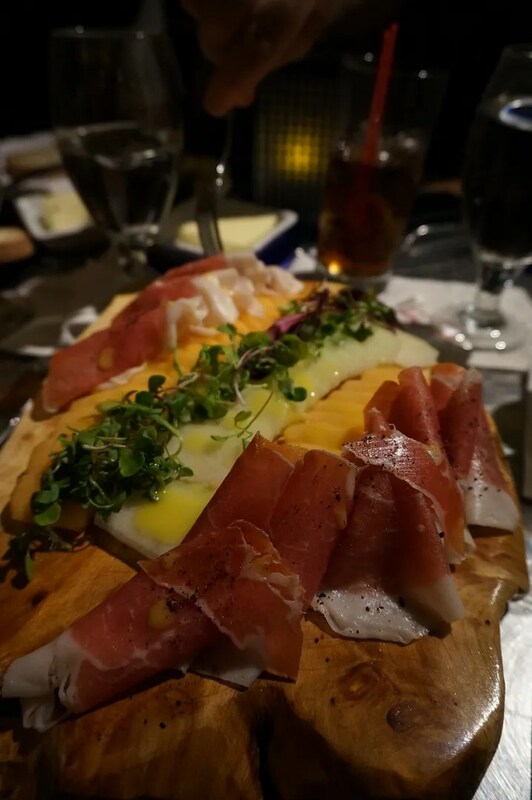 And who knows, maybe one of these days you will be reading my review of a plateful of sashimi…but I wouldn’t hold your breath. Ok, that was the good, but now for the bad. Through the process of ordering and receiving our entrees, our relationship with our server continued to deteriorate. 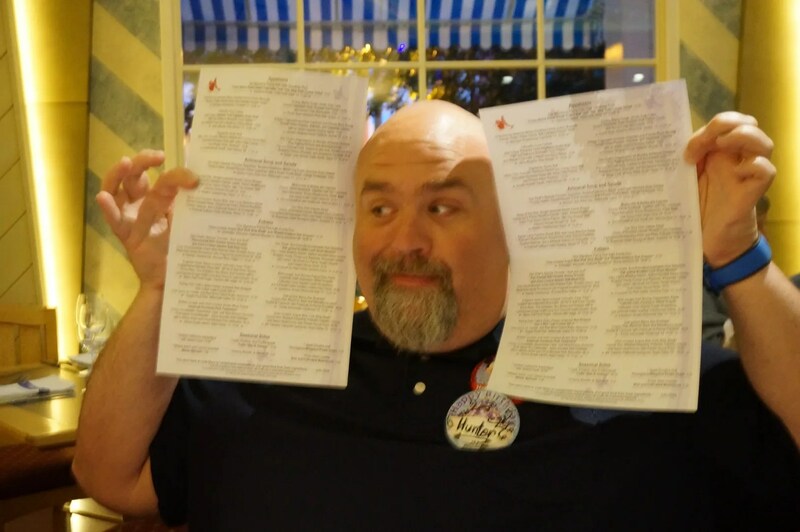 In fact, even before our entrees were ordered, Hunter had had enough of our server and stated that he would place his order directly with the chef. Though Beth is not the complaining type, not long after our entrees were delivered she apparently reached her breaking point. 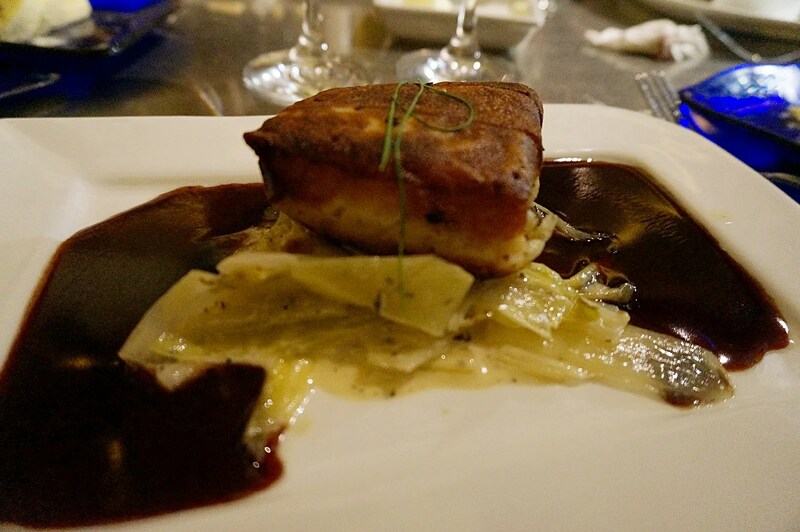 She had had a wonderful dinner at Flying Fish just one week earlier and had sang its praises to us earlier that day. 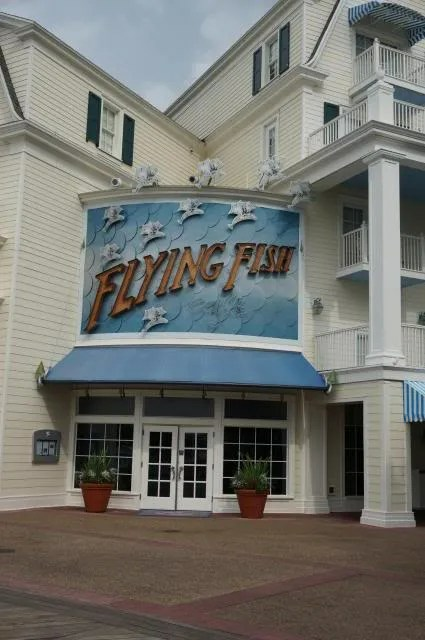 So feeling both disappointed and embarrassed that she had highly recommended Flying Fish, she decided it was time to express her feelings to the manager. And the manager listened and took immediate action. He came to our table and apologized for the poor service which we had received up to this point. He replaced our server with one who had a personality which was much more compatible with our group. The manager assured us that our new server was much more experienced and would take very good care of us for the remainder of our meal. And I’m happy to say that his promise was fulfilled. Our new server was friendly and seemed at ease with us, yet still acted in a professional manner. 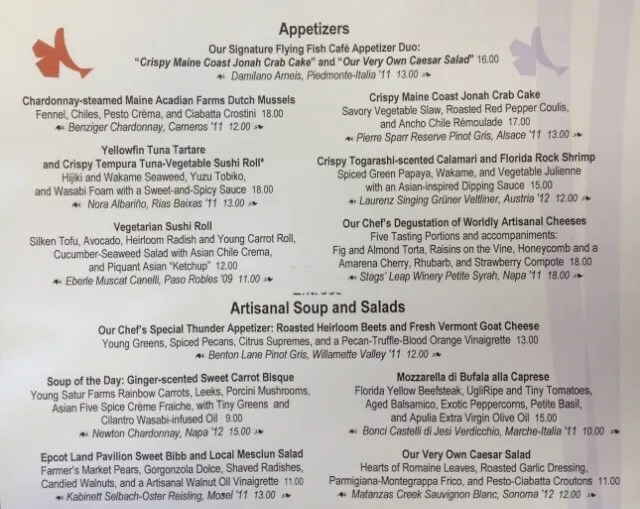 Oh, and as a side note, it seems that our first server had only been employed at Flying Fish for a couple of weeks…which pretty much invalidates his statement that the bread was the same as it had always been, doesn’t it? With the tension and drama now over, I was able to relax and enjoy my dessert. 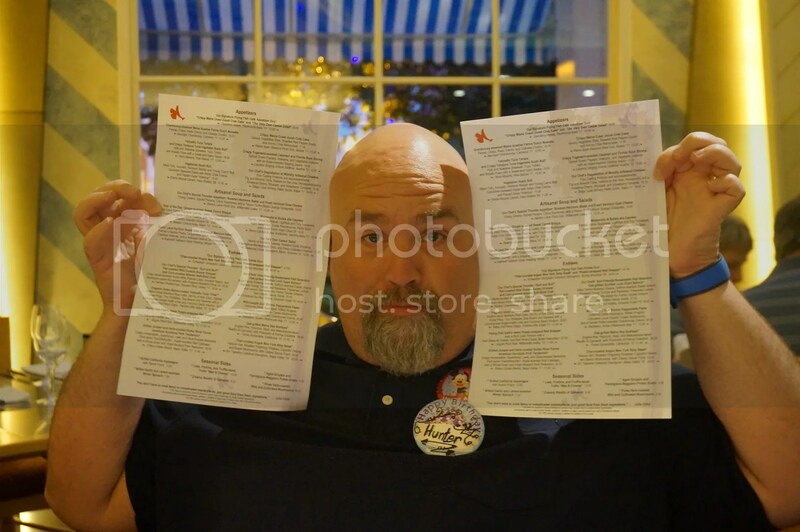 Unfortunately I completely forgot to take a photo of the dessert menu, but hopefully either Brenda or Paula took one. 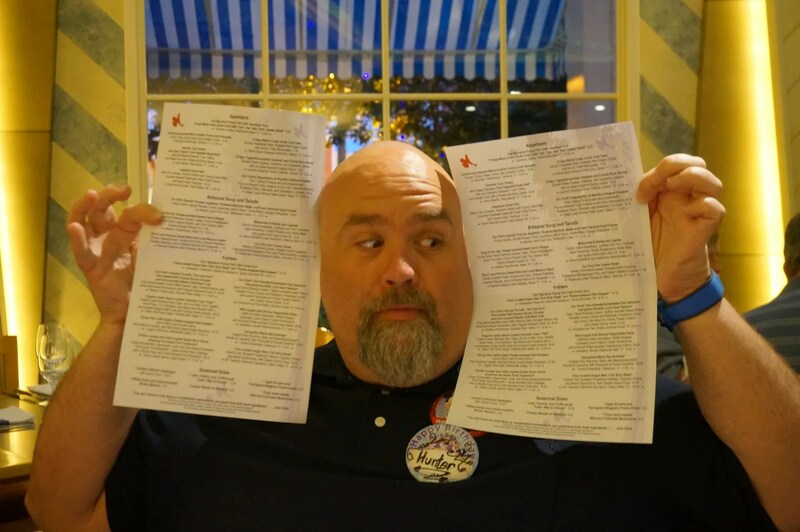 Since I already knew exactly what I wanted, I’m not sure if I even looked at the menu. 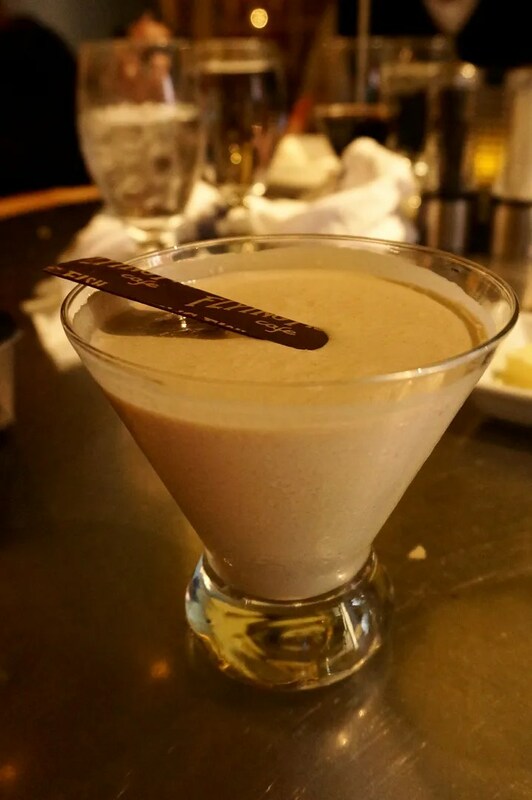 During our dinner here in December we had each gotten to sample an After-Dinner Dessert Cocktail called a Peanut Butter Freeze. I loved this and was greatly looking forward to having it again…only this time the full-size version. But I promised you a surprise ending, so it’s now time for me to deliver. Soon after the above photo was taken, we were told by our server that our entire meal had been comped. That’s right folks…wine flight, appetizers, entree, dessert cocktail, all free. And that was just my share of what we had consumed. Once a little of the shock had worn off, I began calculating in my head what my bill would have been so that I could leave our server an appropriate tip. I estimated that my dinner would have been around $100. Add to this 5 more people and our combined bill could have easily surpassed the $500 mark. So now you know why I am still baffled by this dinner and its surprise conclusion. The problem began with such a minor thing, in the grand scheme of things it was “nothing”, and if our innocent question/comments regarding the bread had been handled appropriately by our server then it would have ended there. 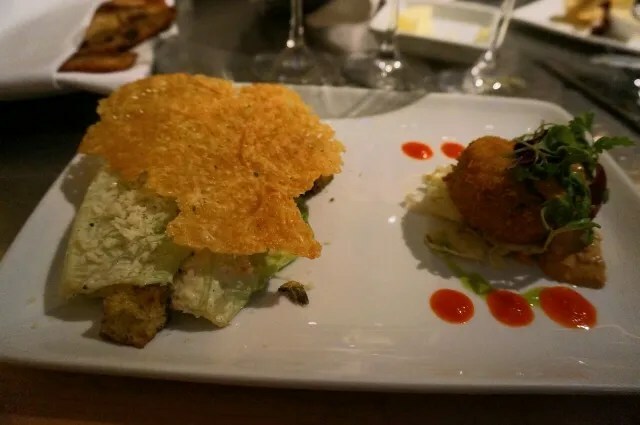 Instead this “nothing” ended up becoming something…something which required the attention of the chef, the manager, and ultimately having our $500+ bill comped. So in conclusion, all the food that I had that night at Flying Fish was delicious and our second server, the chef, and the manager, all went above and beyond to make everything else right. 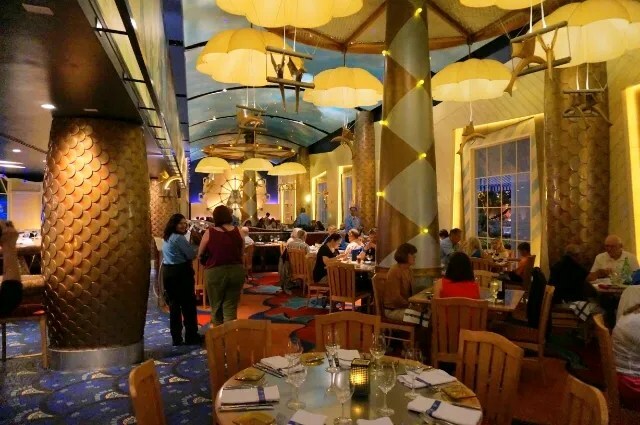 Therefore, I will most definitely return to Flying Fish Cafe. 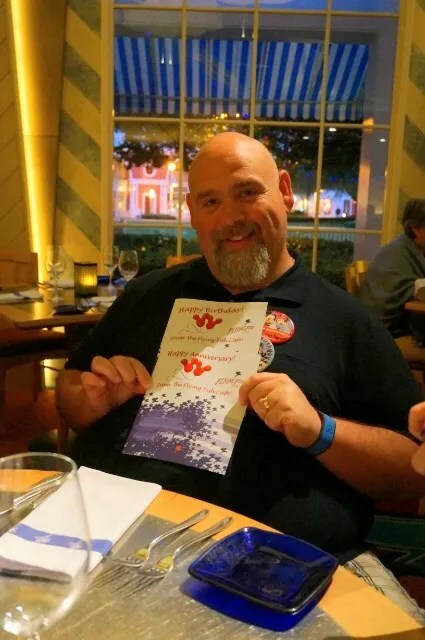 In fact, I already have plans to dine there with Linda (Linda67) during my October trip and am very much looking forward to it. But don’t be surprised though, Linda, if I’m a little leery of the bread…in fact, I think I might just skip it.